Slow Food has been garnering lots of attention lately, with an international convention in San Francisco in September and another in Italy just this week. 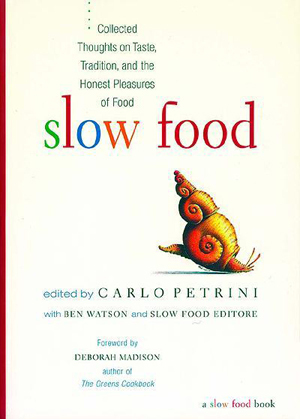 It seems like the perfect time to pull out the Slow Food anthology, this week’s entry in our eco-reads review series. ‘Slow Food’ is one of those elusive yet still useful terms: we’re able to grasp what it’s gesturing at even though we can’t define it precisely. Most of us recognize slow food experiences when we have them and feel, moreover that they are genuinely special and distinctive – this is proof enough that term, and the movement which gave rise to it, are onto something important. Slow Food was founded by Carlo Petrini in Italy about twenty years ago; its membership now numbers tens of thousands and spans over more than 100 countries, including a chapter in northern Israel. The Slow Food collection, first published in 2001, gathers together some of the best writing from the movement’s quarterly journal, and includes short pieces on everything from wine to cheese-making to biotechnology. Taken together, these stories and articles offer something more complex and ambitious than a mere definition, an accounting of what slow food is through a cataloguing of its principles (though the principles are included as well): they are rhetorical, aiming to inspire by painting pictures so lush we cannot help but be drawn in. A firm defense of quiet material pleasure is the only way to oppose the universal folly of Fast Life. May suitable doses of guaranteed sensual pleasure and slow, long-lasting enjoyment preserve us from the contagion of the multitude who mistake frenzy for efficiency. Our defense should begin at the table with Slow Food. The Slow Food Manifesto, from which the above is excerpted, appears at the front of the book, and establishes the book’s tone effectively. It also contextualizes the movement as a whole, which, it turns out, wants to take on something even larger than food: the predicament of human alienation in the face of modernity. Food is the entry point into a larger existential exploration, and the ultimate goal is not just to return to a certain way of producing and consuming food but to reconfigure the very nature of modern experience. 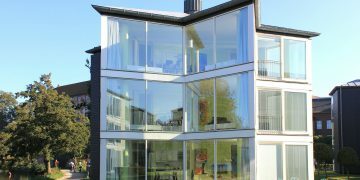 Thus, in the wake of Slow Food we now also have Cittaslow (Slow City), Slow Design, Slow Travel, and a World Institute of Slowness, all geared towards changing the pace and priorities governing our daily lives. Slow Food is the originator of all these, however, and insofar as food is our most direct connection to the natural world, it is fitting that that is the case. The Slow Food collection is at its best when it is most grounded. An article on the annual rooster sacrifice held in villages across Vietnam, for example, or another which takes readers on a guided history of the pickle, offer the oh-so-important telling details, the irresistible minutiae which allow us as readers to enter into other realms of experience and find them somehow familiar. The specific encounters which the more concrete stories convey are deeply compelling, and there will be few readers who aren’t left wishing to share in those moments along with their authors. If the aim of Slow Food is to inspire attentiveness, these are the stories in the collection which are most successful. Where the book falters, however, is on the level of theory. Slow Food is a relatively young movement, and as such it is still beset by growing pains. It paints an absolutely captivating picture of an ideal relationship with food, but tends to fragment on the level of navigating most of our actual practical conditions, and fails to convincingly address the myriad of questions that we face in trying to get from the one to the other. Slow Food has been criticized by some for elitism, offering a picture of a life that is only available to a privileged minority. The more fundamental problem, however, is that Slow Food seems to be confused about its identity. Is it primarily motivated by the aesthetics of food? Social welfare? Environmentalism? These are, we can surely hope, congruent with one another, but to try and develop a case for them all in one book is perhaps over-reaching. The collection raises many points that are familiar to anyone with even a passing acquaintance with sustainable food issues, for instance, but does so without the benefit of citing relevant scientific research in detail. It thereby does its own cause a disservice, for it makes a deep and well-founded theory of responsible food production seem less credible than it actual is. Likewise, while the need for protecting the well-being of farmers in developing nations is a frequently-mentioned theme, any concrete, quantitative analysis of the effects of different agricultural practises and policies on those farmers is noticeably absent. In short, the collection may be trying to do too many things at once: though extremely well-intentioned, it sometimes resorts to hand-waving where sustained arguments are called for. Slow Food was born out of a desire to preserve a certain kind of experience; its writing succeeds most wherever it keeps that experience in the foreground. The chapters on street food, markets, and wonderful world of leftovers serve as a better introduction to Slow Food than any theoretical account ever could, and those alone are enough to make the collection worth reading.